Many beach toys are made of cheap plastic that often contains PCV (polyvinyl chloride), phthalates, and BPA (Bispehnol A), all of which are endocrine disruptors and can mimic a body’s hormones, upsetting the normal balance and even potentially stimulating the growth of tumors. Traditional sunscreens also contain unhealthy ingredients such as oxybenzone, which is a synthetic estrogen that can contaminate your body. All this is harmful to you and the environment. The plastic we purchase and throw away takes up to and over 500 years to biodegrade. And many summer products are often left on beaches or washed into the sea, making them easily accessible to wildlife that mistake it for food. If the island or resort doesn´t have a recycling program, re-pack all your products into reusable containers and jars at home. 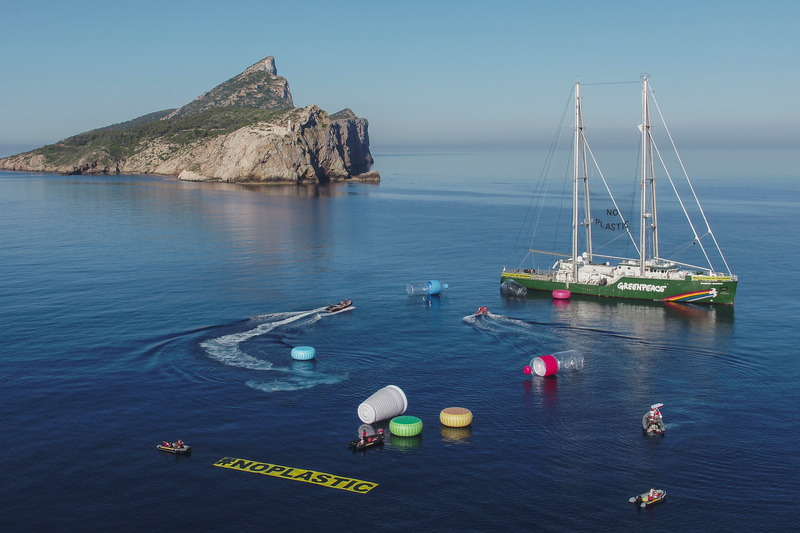 This action is part of the international campaign “Less plastic, more Mediterranean” in which the flagship of Greenpeace, Rainbow Warrior, is touring the Mediterranean to denounce the huge presence of plastic in the sea and to demand governments in the region to take urgent measures to stop this serious problem.